My name is Wahyu Wijanarko. I'm just ordinary person who is doing ordinary things. Born at January 7th, 1984, grew up in Yogyakarta. 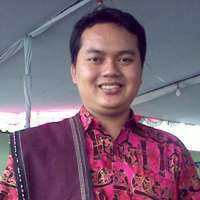 I am graduated from Gadjah Mada University with ST (Engineer) degree majoring in Electrical Engineering in November 2005. I worked as web programmer, database analyst, and server administrator. Today, I'm working as Business Development Manager at Global Intermedia, an IT company located in Yogyakarta. I'm also the founder of ketawa.com humor portal. I like playing music instrument, and mainly playing piano and guitar. I wrote articles in some magazines, and online journal. I also wrote some computer-related book. You can view my entire articles and paper summary by clicking this link.